Hot Contest: Win a brand-new Sony Cyber-shot Digital Camera! This Contest Ended on April 30, 2009. You cannot enter any more. The winner will be announced shortly. Recently, we gave away a Dell XPS 16 laptop to a lucky winner as well as a Apple iPod Touch to another winner. 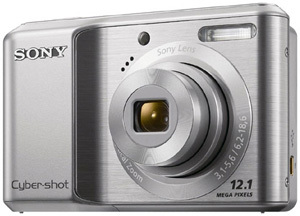 Now we have another exciting contest where the prize is a Sony Cybershot S2100 12.1 MP Digital Camera. In the current contest one lucky person will win a new Sony Cyber-shot Digital Camera from BestOnlineCoupons.com. To enter all you need to do is submit a review of a merchant listed on this website. It is our way of rewarding people like you for sharing your shopping experiences. This also allows us to get more real consumer reviews to share on our coupons site, which is helpful for all visitors. Each quality review submitted between March 30, 2010 and April 30, 2010 is an entry into the contest (one will be randomly selected as the winner from the entries received.) So submit reviews of all the the online stores and Internet services you know about to increase your chance of winning. However, only review those merchants that you have personal shopping experience with, to keep our reviews as accurate and useful as possible. The contest prize is a brand-new Sony Cyber-shot S2100 digital camera. This Sony Cybershot is a 12.1 megapixel digital camera with 3X optical zoom, a large 3.0 inch screen, built-in SteadyShot image stabilization, Smile Shutter, and Face Detection technology. All in all this Sony digital camera is loaded with features to help you take great pictures with ease. The Cybershot DSCS2100 even supports video with a frame movie mode and video capture at up to 640x480 at 30 fps. If you don't win, maybe you'll want to buy a Sony Cyber-shot DSC S2100? There are many places we list coupons for that sell them, so check out these pages for deals: SonyStyle.com coupons, Dell coupons, Best Buy, Target, Newegg.com, Walmart.com, Tiger Direct and B&H Photo Video. Timing. The contest starts at 12:01 AM CST on March 30, 2010. The contest ends at 11:59 PM CST on April 30, 2010. All reviews must be submitted during this time period to qualify as entries into the contest. Selection of Winner. On or about May 1, 2010, one potential winner will be selected by randomly choosing one of the published reviews. If that person and the review meet the elgibility criteria, they will be awarded the prize. If their email address is not valid or they do not respond to the notification within seven (7) days, the prize award will be rescinded. This procedure will be repeated as necessary until there is one (1) eligible winner that has claimed the prize. Prizes. One (1) prize will be awarded. The approximate retail value of the prize is $120. No prize substitution, cash redemption, assignment or transfer of prizes by winner is permitted. We reserve the right to substitute a prize with another prize of equal or greater value. Limit of one prize per person. As one of the leading online coupons sites for many years, BestOnlineCoupons.com is stocked full of thousands of coupon codes, promotional deals, special offers, clearance sales, and other discounts. Now we also have thousands of real-life customer reviews of the merchants and services we list on our site. Out coupon codes help you save, while our reviews help you make an informed shopping decision. Plus, if you submit your own reviews, you can have a chance to win a brand-new Sony Cyber-shot S2100 digital camera.